I received my Master's Degree from the University of Delaware, focusing on museum studies and medieval and early modern European history. I am particularly interested in print culture, material culture, and women's history. Throughout my academic and professional career, I have sought to gain experience with archives, collections, education, social media, and more, with an eye to how my skills can be employed in small and medium-sized museum work. Feel free to look at some of the past work I've uploaded onto this website, which includes graphic design work, videos, PowerPoints, and journalistic and academic writing samples. 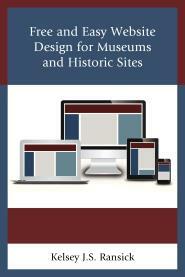 Part of the AASLH series, this book is intended for museums and historic sites faced with small budgets and staff that might find it intimidating to redesign or create a website from scratch. Concerns over resources make coding and designing (or hiring someone to do so) daunting and expensive, but it does not have to be so. All of the tools discussed in the book are free at the base level, and some offer upgrade packages with even more features. The advice and techniques are all created with an eye to making websites work for smaller institutions with limited budgets and timeframes. Every museum professional has come across issues when adapting general software for an institution’s specific needs, and the information in this book will anticipate some of these needs by offering easy-­to-­implement workarounds and information on related software or services that integrate with each website. Learn more about the book at freethemuseum.net. Buy the book at Amazon.com or from Rowman & Littlefield publishers. Thanks to all my colleagues who sent in responses for my word-cloud!